Money Night A Go Go is the oddest Go Go bar I visited in Patong. To be honest, I have difficulty defining how it works in there. The first time I visited with a friend, out of curiosity… each place deserves to be checked once. We moved in, close to the stage, and as soon as we were seated a girl handed me the drink list. So far nothing unusual. And then we looked at prices: 800 baht for a beer and 600 for a coke! Right… “I give you discount, only 400 for the coke” she said, but I didn’t hear well the end of her sentence, I was already running out, laughing. Weeks later, I made a decision… I will invest 400 back for the coke and check out why there actually were so many people inside this “Money Night A Go Go” thing. So here I was again, with my 400, ready to bargain hard. But then a weird thing happen: a guy in front of the place casually said: “200 baht, includes a drink”. Ah did they just changed it because they lost us last time? hard to believe. Anyway, at that price i was in good mood for whatever was going to happen in there.So… is Money Night A Go Go the ‘same same but different’ ol’ Go Go Bar? We were in for a surprise. We just had time to sit, when the ‘show’ started. Ok, if you are not curious by nature or easily shocked, you might want to click on the ‘Waterfalls‘ link. So the expected girls are mostly elder woman, they obviously know their show and had performed it countless times. In most Go Go, you get two, maximum three numbers in a row. But that night we got the ‘Full Monty’. Everything on the menu you probably saw in Bangla Road happened that night, add to this a snake show and you might get the picture. It’s not pretty but i certainly is jaw dropping. Did I mention that to my surprise, half the audience were young women? I think their jaw were dropping twice more than mine, possibly they were more able to imagine themselves ‘trying this at home’ than me. So we got all the items on the menu, flying ping pong ball, dart popping balloons, razor blade attached to a string, little bird little fish ugly toad, firecrackers (yes) and open a bottle of beer, with, with… well not with their hands. Then the snake guy came in all all the girls in the audience turn clearly paler. He had three or four types of snakes, all venomous, and he got bitten several time. Didn’t seem to bother him much. I’ll won;t say much about snake show, snakes shouldn’t even be here. So at the end, it confirmed my theory that each place deserves a second chance. But wait, don’t go yet. Weeks later, a friend was visiting, so I thought that would probably give him a good story to tell once back home, so let’s take him to Money Night before we move on to our favourite ‘Devil’s Playground‘ or ‘Suzy Wong‘. 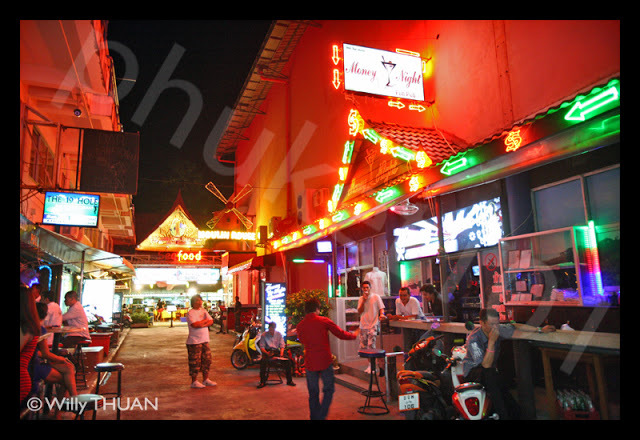 So here we are again… 200 baht please, so far so good… “has the show started?” asked someone… “oh yes, just started sir” said the guys… Hesitation, but well, we had a long night planned ahead, so let’s go in. We sat, ordered a drink…. while the last lady was collecting her accessories and left the stage. The show just ended. Usual girls came in to dance and that was it… and girls at Money Night are not the hot type. So the lesson is… only go if the price is 200 baht at the entrance, and make sure the show hasn’t started yet… If these two requirements are fulfilled, you are in for a surprise!